A day off of my full-time job. I want to craft all day. I should go to the pool and "work" on my tan. Instead I am in the Paper Jungle. Maybe I'll take a nap next. I've shut the door on a real problem. 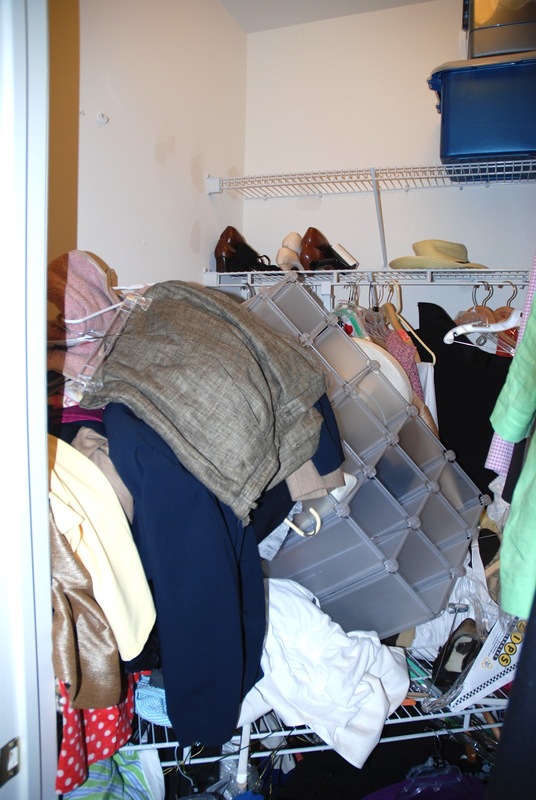 The shelves in my walk-in closet collapsed. The only real "weight" they had on them was from the 30 garments just freshly back from the dry cleaners. Which now lay at the bottom of this pile. My shoe organizer ... emptied in the fall. I must clean it out. dumping everything, everywhere. What a mess! I say just craft!! We all need to take some time for ourselves. I work a full time job and I know how you feel. The closet will still be there. lol. Just work on it a little bit at a time during the week, and by the next day off you'll have it done and ready for you time again! !